As people began to take their bowls and ask “where are the spoons?” Cookie laughed and turned to Eddie and said, really loud “Do you hear that? They want to know where the spoons are!” Turning back to the group she said “Here in New England, we don’t eat chowder with spoons.” Then she lifted a bowl to her mouth to demonstrate. Eddie laughed too and chimed in “That’s so funny. I guess in other places they use spoons for chowder. “Everyone started to laugh and raise their bowls to their mouths, happily embracing the local custom. 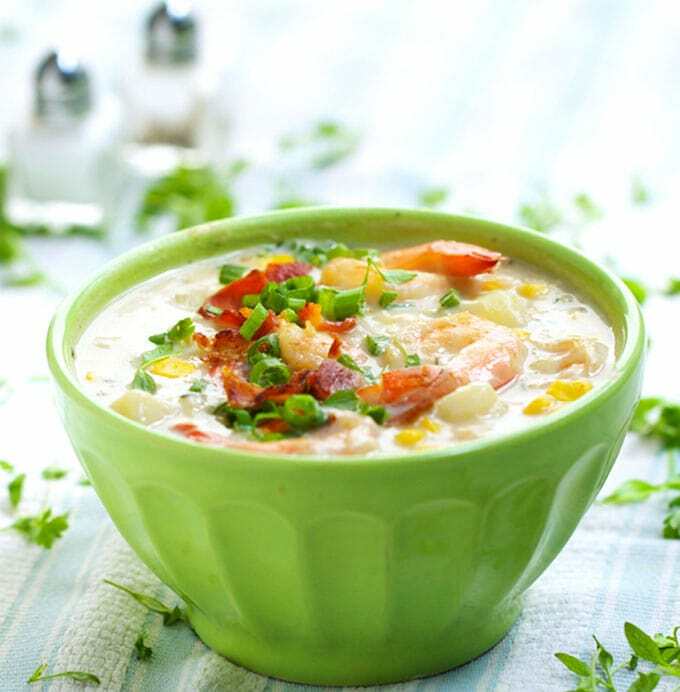 This is a really tasty, lightened-up shrimp and corn chowder, adapted from Cooking Light. There’s no cream at all. The base is chicken stock and low-fat milk…and there’s just enough butter and bacon to make it taste decadent! I honestly can’t imagine drinking New England clam chowder out of a bowl – it’s pretty thick! But the folks from North Carolina went along with it, and Eddie and Cookie were saved! 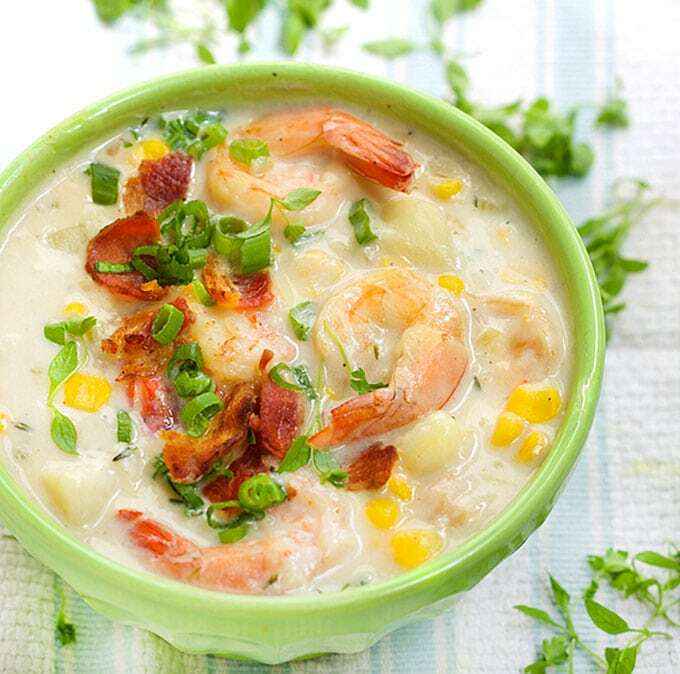 Here’s the recipe for Shrimp and Corn Chowder. If you try this recipe I hope you’ll come back to leave a comment. I’d love to know what you think! 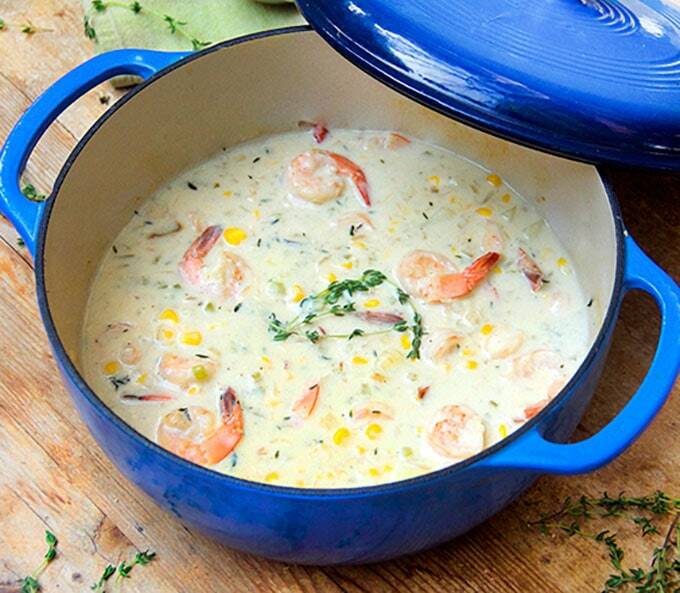 A easy, delicious, lightened up shrimp and corn chowder. Boil Potatoes Put the cut potatoes and 1/2 teaspoon salt into a medium saucepan filled halfway with water. Bring to a boil and cook for 10 minutes, until potatoes are just tender. (They will soften up more in the soup) Drain and set aside. Make Chowder While the potatoes are boiling, cook bacon in a large kettle or dutch oven over medium heat until crisp, about 4 minutes. Transfer bacon to a paper-towel-lined plate. Pour drippings into a heat-proof bowl or mug. Wipe any blackened bits out of the pot. Return 1 tablespoon of drippings to the pot along with 1 tablespoon butter. Add onion and celery. Saute over medium-low heat until softened, about 8 minutes. Add garlic and thyme sprigs and sauté 2 minutes longer. Sprinkle flower into the pot and cook, stirring constantly, for 1 minute. Add milk, broth and bay leaf. Bring to a boil. Reduce to a simmer and cook 2 minutes. Add salt, black pepper, cayenne, shrimp, corn and cubed potatoes. Simmer until shrimp are just cooked through, about 4 minutes. Discard bay leaf and thyme stalks. To Serve Divide soup among 4 bowls. Crumble bacon and sprinkle on top, along with sliced green onions. Made this tonight.. It was delicious! Thanks for posting this! I love the chowder, but even more the story. I can just imagine a group of people drinking the soup as if it were cafe au lait. My daughter and I went to the Cape for the day 2 weeks ago and to Newport last Friday. Both times we had lunch and had chowder in both locations. She commented on Friday how chowders are so different in different restaurants and asked if I had a recipe…………………..AND HERE IT IS!!!! Chowder at the Crooks house this weekend. Can’t wait. Lovely story – my kind of eating! Great looking recipe – Lisa. Yeah for Eddie and Cookie! I love your anecdotes and recipes! I spent the weekend in RI with my whole family and was transported to my youth as we “chowed” on N.E. and Manhattan Chowder. Everyone can argue which is their favorite. I remember also have R.I chowder which is the clear broth. Nothing beats the milk-based though. Thanks for sharing…. 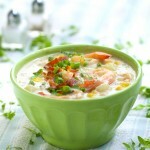 Oh my this chowder reminds me of a chowder I had in my life decades ago. Wow, I am jazzed. I am a major soup person to start with. Thank you.